The original First National Bank of Galveston Building, designed by P M. Comegys for T. H. McMahan, Esquire, was three-story and erected in 1867 of pressed brick from Baltimore. The Strand front and all the door and window surroundings were of iron, including the cornice. The bank's vault was cast solid in Albany, New York, of chilled iron two inches thick. It was described at the time as being so massive that… "nothing short of a respectable earthquake could thunder it open.” The present two-story building at this site was built after a fire in 1877 destroyed the original building and all others on this block. This present building is a near replica of the original, but diminished by one-story. Indeed, reports say that the cast-iron hood moulds and Strand street front of the original were salvaged and re-used. First National Bank image Courtesy of Rosenberg Library. 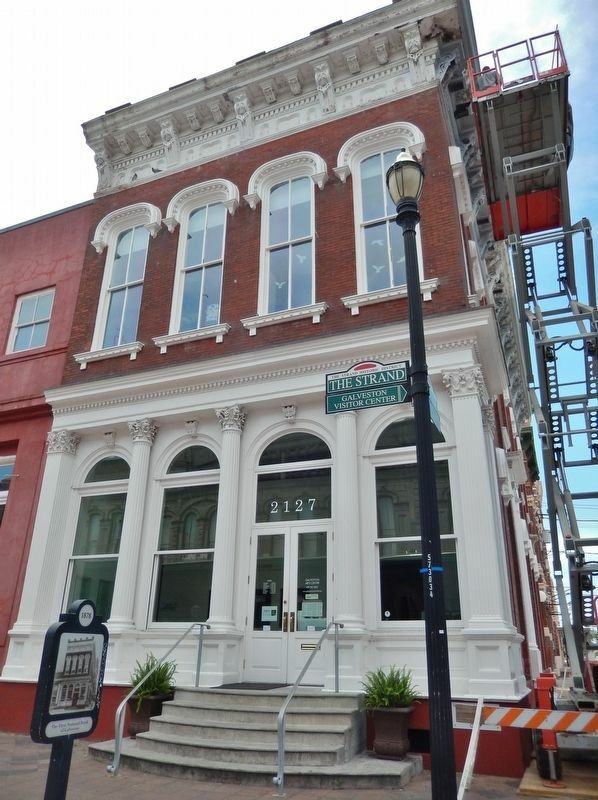 The bank's first office was the lower floor of the Hendley Building at the corner of 20th and Strand. The names of the officers throughout the bank's history represented the highest echelons of Galveston's business community, with such leaders serving as: Thomas H. McMahan, Henry Rosenberg, Julius Runge, George Ball, George Sealy, James Moreau Brown, Morris Lasker and Mrs. R. Waverly Smith, the first woman bank president in Galveston. The First National Bank remained in continuous operation at this location until 1955, when it merged with the Hutchings-Sealy Bank to become the First Hutchings-Sealy National Bank. Following this merger, the old bank building stood largely vacant. 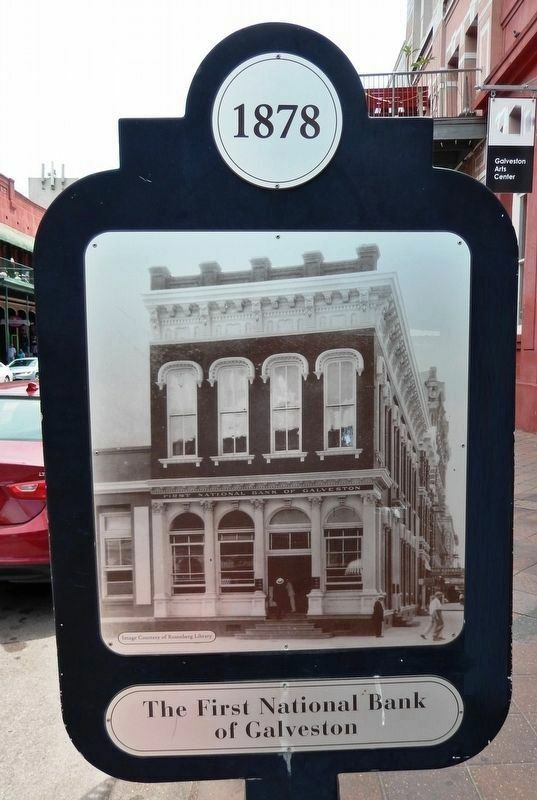 In 1969, the Junior League of Galveston purchased and then restored the building to house the Centre on the Strand, whose purpose was to promote the cultural and educational environment of the community. 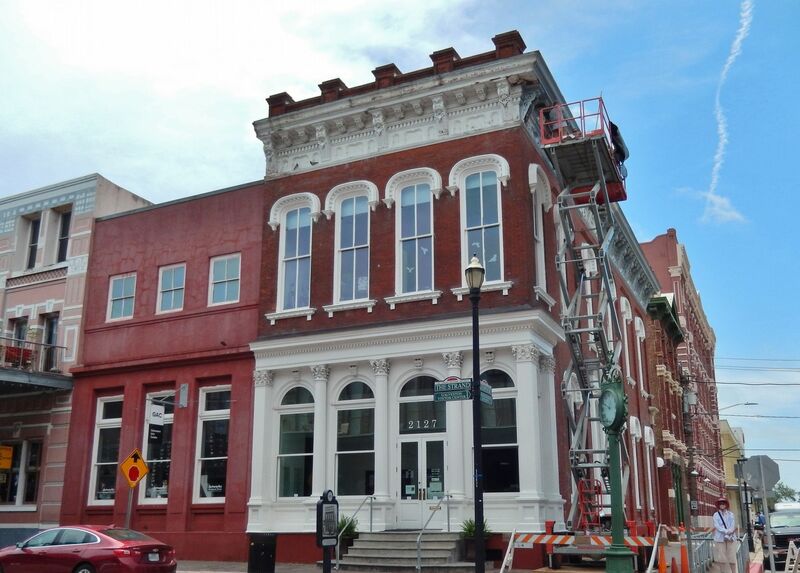 This pilot project helped originate the ongoing preservation and restoration program for The Strand. In 1972, the Galveston County Cultural Arts Council opened a gallery in the building along with the arts center classes and workshops to promote awareness of the arts in the county. on Strand Street east of Kempner Street, on the right when traveling east. Touch for map. Marker is located along the sidewalk, on the south side of Strand Street, directly in front of the subject building. Marker is at or near this postal address: 2127 Strand Street, Galveston TX 77550, United States of America. Touch for directions. Other nearby markers. At least 8 other markers are within walking distance of this marker. Juneteenth (within shouting distance of this marker); The Strand (within shouting distance of this marker); Trueheart-Adriance Building (was within shouting distance of this marker but has been reported missing. ); Mallory-Produce Building (within shouting distance of this marker); The Stewart Building (within shouting distance of this marker); Old Galveston Square (about 300 feet away, measured in a direct line); Central Wharf (about 300 feet away); Samson Heidenheimer Building (about 400 feet away). Touch for a list and map of all markers in Galveston. More about this marker. Marker consists of two large laser-printed metal plaques, one with text and one with an historic photo, mounted vertically at eye-level, on either side of a five-foot tall post. 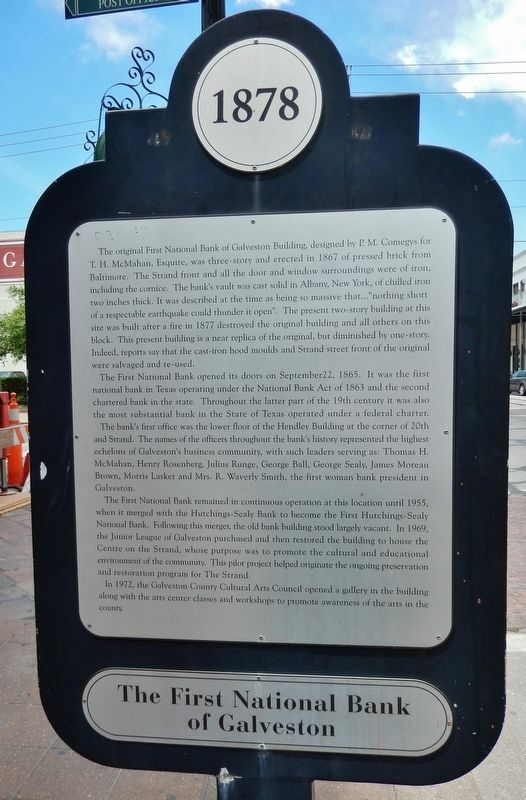 Regarding The First National Bank of Galveston. The building is currently occupied by the Galveston Arts Center. More. Search the internet for The First National Bank of Galveston. Credits. This page was last revised on February 28, 2019. This page originally submitted on February 27, 2019, by Cosmos Mariner of Cape Canaveral, Florida. This page has been viewed 59 times since then. Photos: 1, 2, 3, 4. submitted on February 27, 2019, by Cosmos Mariner of Cape Canaveral, Florida. • Andrew Ruppenstein was the editor who published this page.